The Pope and the Red Men. The Pope, in giving an audience to Colonel Cody and his Indian followers, showed the traditional tenderness of the Roman Church towards the red men. 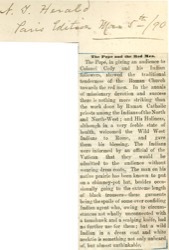 In the annals of missionary devotion and success there is nothing more striking than the work done by Roman Catholic priests among the Indians of the North and North-West; and His Holiness, although in a very feeble state of health, welcomed the Wild West Indians to Rome, and gave them his blessing. 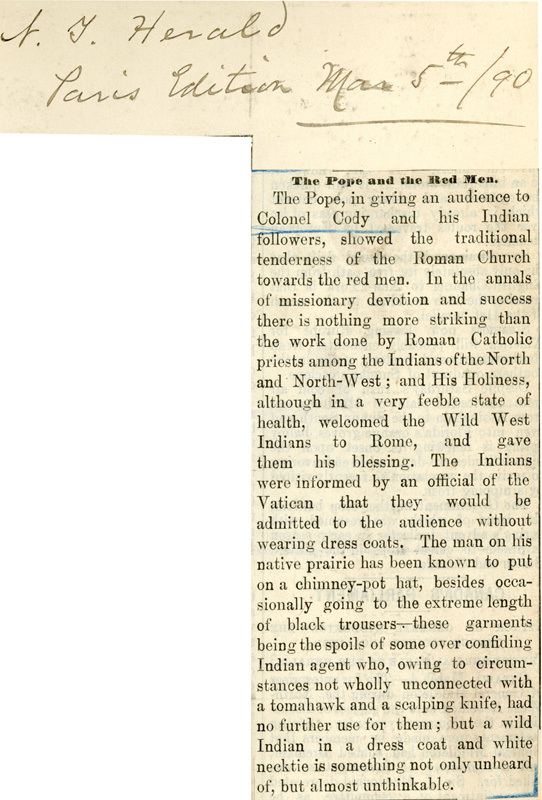 The Indians were informed by an official of the Vatican that they would be admitted to the audience without wearing dress coats. The man on his native prairie has been known to put on a chimney-pot hat, besides occasionally going to the extreme length of black trousers—these garments being the spoils of some over confiding Indian agent who, owing to circumstances not wholly unconnected with the tomahawk and a scalping knife, had no further use for them; but a wild Indian in a dress coat and white necktie is something not only unheard of, but almost unthinkable.